The Girard project was born out of a desire to help the neighboring Cathedral of the Holy Cross, which owns the land the building was constructed upon, generate revenue to support its current and future operations. 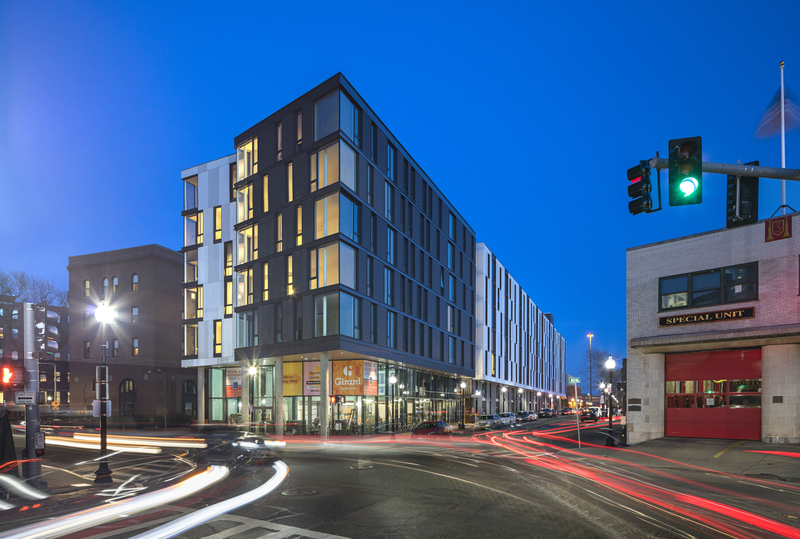 Agreeing to a 99-year ground lease with the Roman Catholic Archbishop of Boston, 160 luxury apartments, 3,600 sf of retail space and 162 parking spaces were constructed and substantially completed in October of 2016. 21 of the apartments are affordable to households earning less than 80% of Area Median Income. The amenity-rich community features carefully curated common spaces inspired by mid-century modern design, including a common room with panoramic views of Boston, complete cooking facilities, a fireplace and a library and a roof terrace with cooking grills and a gas fire pit. The interior design pays homage to designers such as Alexander Girard, Ray and Charles Eames, and Florence Knoll. Girard also hosts multiple galleries featuring a rotation of local artists to celebrate the South End SoWa district’s rich artist culture. The $72 million project was designed by Utile and constructed by Consigli.